Modi's sharp attack on TMC chief came as he kickstarted BJP's election campaign in the West Bengal which sends 42 members to Lok Sabha. Prime Minister Narendra Modi on Wednesday made a scathing attack on West Bengal Chief Minister Mamata Banerjee describing her as a “speedbreaker” in the path of development of the state and insisted she has to go to ensure speedy development of Bengal like rest of the country. Modi also took on the Congress over its manifesto that talks about reviewing some clauses of the Armed Forces Special Powers Act (AFSPA), saying it acts like a “shield” for the security forces in the fight against terrorists and make the soldiers vulnerable. He also took potshots at Trinamool Congress president as well other opposition leaders for expressing doubts over Balakot airstrike to avenge Pulwama terror attack and mockingly said “more than pain felt in Rawalpindi, it was felt by Didi in Kolkata”. Modi’s sharp attack on TMC chief came as he kickstarted BJP’s election campaign in the West Bengal which sends 42 members to Lok Sabha, third largest after Uttar Pradesh’s 80 and Maharashtra 48. “I have not been able to ensure development of Bengal in the same speed as in the rest of the country. The reason for this is that in Bengal there is a speedbreaker, and this speedbreaker is known as Didi,” Modi said attacking chief minister Mamata Banerjee, who is fondly called “Didi” (elder sister). Alleging that the Congress manifesto talks of reviewing AFSPA that “provides a shield to the security forces in the fight against terrorists”, Modi said that the grand old party of the country “conspired” to make the soldiers vulnerable by taking this away from them. 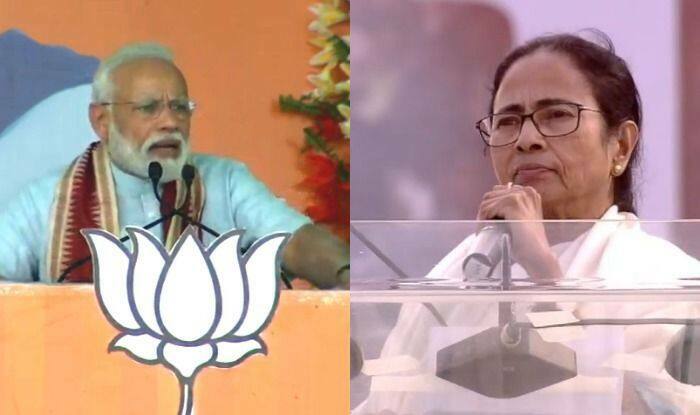 In his no holds barred attack on TMC president, Modi said that Banerjee has deprived the people of Bengal of getting medical benefits of up to Rs five lakhs under the ‘Ayushman Bharat’ scheme, by withdrawing the state’s consent to it. “She has put brakes in the path of the development of the poor,” he said. Modi said that chit funds have looted the poor of Bengal and were assisted by ministers in Banerjee’s cabinet, her MLAs and associates. “Didi has destroyed through her associates the poor people who invested in the chit funds,” he said. “Chot usko laga aur dard inko lagi (The hurt was there and the pain was felt here),” he said. He said that the Left had not allowed the development of the state during its 34-year rule and Banerjee had done the same.